Discovering blood in your urine, also known as hematuria, can be very unsettling. If this happens to you, it may be the result of a chronic disease or an acute infection, both of which require medical attention. Any blood found in urine would ultimately be linked to the urinary tract. The is the system comprised of the kidneys, the ureters (thin tubes that carry urine to the bladder), the bladder, and the urethra (the tube that carries urine from the bladder out of the body). While the causes of gross and microhematuria may be similar, there are important differences. Microscopic hematuria can arise from anywhere in the urinary tract, beginning with the kidneys and ending with the urethra. Gross hematuria, by contrast, is usually due to problems in the lower urinary tract where blood is less likely to diffuse and go unnoticed. It's important to note that discoloration is not always due to blood. Eating certain foods, like beets or rhubarb, can give urine a pinkish to red color. Some medications have the same effect. On the other hand, if your urine has a deep brown hue (which we often referred to as being "coca cola colored"), it may be an indication of an acute liver problem, such as hepatitis. Hematuria is a common symptom occurring in roughly a third of all people during the course of their lifetime. A single episode may be related to a mild condition such as trauma, whereas persistent or recurrent hematuria is suggestive of a more serious medical condition. Kidney stones are often large and jagged and can cause damage as they travel through the ureters, bladder, or urethra. Urinary tract infections (UTIs) can develop anywhere from the kidneys to the urethra. Bleeding is typically the result of a long-standing, untreated infection. In addition to discoloration, the urine may be foul-smelling. Interstitial cystitis is a condition that can produce pain and bleeding when urinating. Kidney diseases, both acute and chronic, can result in urinary bleeding. People with diabetes are particularly prone to developing kidney problems. Benign prostatic hyperplasia (enlarged prostate) can also cause bleeding, usually in men over 50. Bladder and kidney cancer are less likely causes of hematuria, but bleeding is common with the formation of a malignant tumor. Prostate cancer can also cause bleeding in the adjacent urinary tract. Medication that thins the blood, including aspirin and heparin, can cause hematuria. Sexually transmitted infections associated with the formation of open ulcers are also possible culprits. Injury to any part of the urinary tract can result in blood in the urine. Sports trauma and auto accidents are common sources of these injuries. Exercise-induced hematuria a fairly common cause of microscopic hematuria. Its presence in military recruits earned it the title "march hematuria." It is important to remember that hematuria is a symptom and not a disease. As such, it such not treated symptomatically. Rather, treatment is focused on resolving of the underlying condition whatever it may be. One that is successfully treated, the bleeding will usually stop. 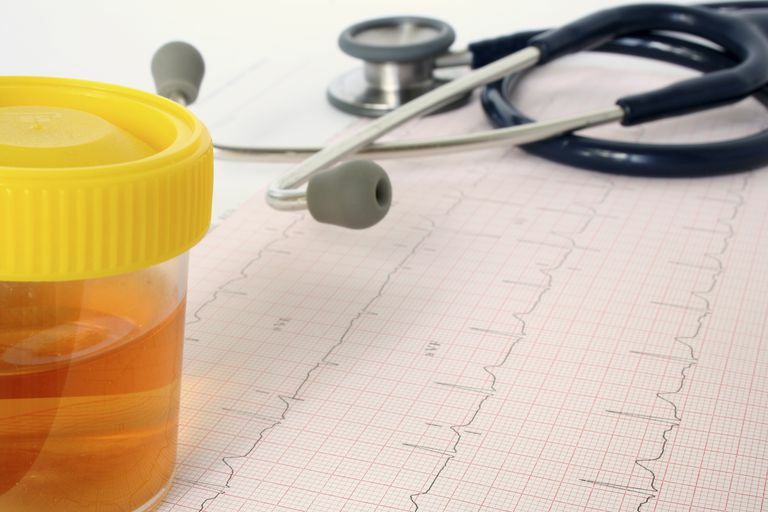 If you have blood in the urine, your doctor will typically ask you for a urine sample. A full urinalysis will not only look out for red blood cells but for protein, glucose, or any signs of infection. The presence of excess protein (proteinuria) is particularly helpful as it may point us in the directions of kidney impairment. Kidney function can be assessed using blood tests to evaluate creatinine (CR) and blood urea nitrogen (BUN), among other things. Imaging tests may include an ultrasound, computerized tomography (CT) scan, or magnetic imaging resonance (MRI). Cystoscopy may be used to visually examine the bladder using a flexible catheter equipped with a camera that is inserted through the urethra. A biopsy may be required to evaluate any suspicious findings in your kidneys or bladder. If you notice blood in your urine, make an appointment with your doctor to have the necessary tests performed. There may be many different reasons for blood in your urine, so don't assume the worst. Many causes are easily treated. If your primary care physician thinks the problem is due to a chronic condition, he or she may refer you to a specialist, such as a urologist, for further investigation. However, if bleeding and pain accompany hematuria, it's important to seek medical care as soon as possible. In end, it may only be a simple infection, but it could also be an indication of a more serious illness requiring emergency intervention. American Urological Association. "Diagnosis, Evaluation, and Follow-up of Asymptomatic Microhematuria (AMH) in Adults." Linthicum, Maryland; 2012. Loo, R; Whitaker, J.; and Rabrenivich, V. "National Practice Recommendations for Hematuria: How to Evaluate in the Absence of Strong Evidence?" Permanente Journal. 2009; 13(1):37-46.